Assuming the 2010 Chevy Camaro ever makes it to production, Hennessey is ready with a stonkin' 705 HP supercharged upgrade kit ready to hoover up $109,000 of your dollars. Production 2010 Chevy Camaro Revealed! No matter how the new Camaro ends up, that's a huge pile of tithing for a mullet-mobile. If you're happy with a monster supercharged mill, carbon brakes, carbon fiber bits and pieces and epic badassery, it may be worth it, but otherwise, wow. Click HERE for a full resolution image, and all the details lurk below. SEALY, TX – Hennessey Performance Engineering (HPE), well known for their extreme performance sports cars and muscle cars, announces their Limited Edition 2010 HPE700 Camaro. At the heart of the beast is GM's new LS9 supercharged V8 tweaked as only HPE could to 705 horsepower and 717 lb-ft torque. To qualify as a supercar under the HPE banner it can't just go, it has to whoa. With optional 15 inch carbon brakes from the stunning new Corvette ZR1, light weight HRE wheels with Michelin PS2 tires and full suspension upgrades the HPE700 Camaro will be able to make full use of its new found power. In addition to the power and handling upgrades., Hennessey will also be offering an exterior aerodynamics package to improve downforce at high speed. Penned by British designer, Steve Everitt, Hennessey's Cam-Aero ™ body upgrades include: Carbon fiber rear lip spoiler, carbon fiber side rocker panels, carbon fiber front splitter, front fascia with hideaway-look headlights and front billet grille. Completing the look of the HPE700 is a ZR1 inspired hood design with window showing off the Hennessey's tweaked LS9 powerplant. "The HPE700 Camaro allows our customers to combine supercar power and performance with classic American muscle car looks in a modern, daily-drive usable sportscar with a backseat and a trunk!," said John Hennessey, President and CEO of Hennessey Performance Engineering. "We will be announcing other Hennessey turnkey vehicle packages for the 2010 Camaro in the near future along with an extensive list of aftermarket performance parts and accessories. 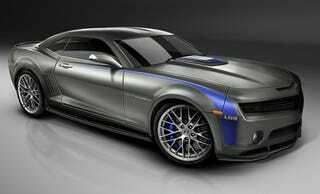 But for now, the LS9-powered HPE700 Camaro, replete with ZR1 inspired looks and performance promises to be at the top of the American muscle car food chain later in 2009. HPE700 buyers will also receive a 1-day performance driving course at Lonestar Motorsports Park – a ¼ mile dragstrip facility located adjacent to Hennessey's 24,000 square foot production facility and showroom. Located just west of Houston Texas at the Lonestar Motorsports Park complex, HPE has been building American supercars for nearly two decades with its Veyron-beating Venom Vipers, Ford GT's and recently released Dodge Challengers.